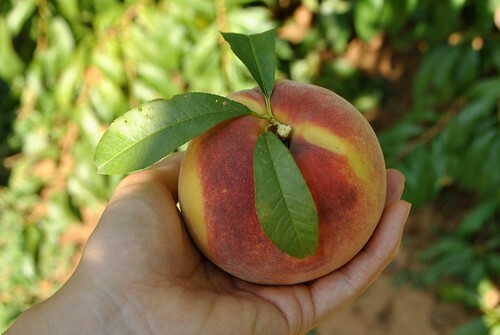 I’ve actually never gone peach picking. Or at least not until yesterday. 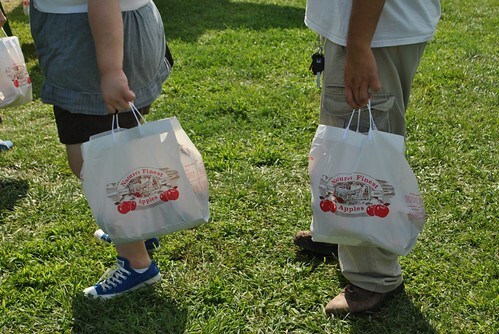 Instead of meandering North, like I would for apple picking, I meadered South, into Jersey, to join some friends in their annual peach picking trip. It was a fun outing. It was my friend’s new baby’s first outing to boot! 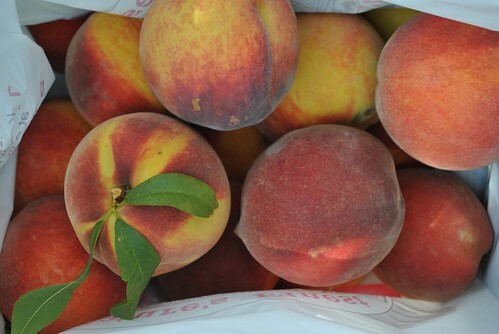 I filled up a bag full of peaches all the the while thinking about all the things I could make with them! First, my thoughts went to peach pie. I could make a pie, or how about mini pies? But where would I get mini pie tins? Or do I need to spend more money for mini pie tins? I think I saw somewhere someone made individual pies, but empenada like and with pie crust. That sounds like a good idea. Then fast forward to Sunday afternoon, post 15 mile run, post breakfast club meeting. A wave of laziness fueled by a hearty breakfast and the effects of a long Sunday run, made pie crust seem like not such a great idea. 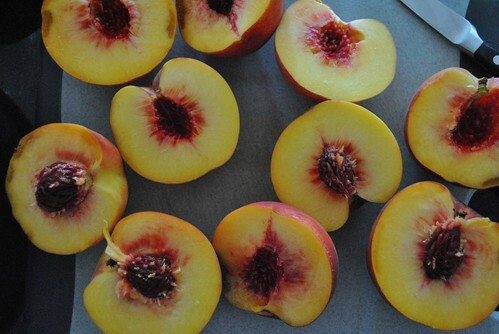 So, I started thinking, what can I make with the contents of my kitchen and the peaches that does not require effort. Peach cobbler? A work buddy just told me she had made peach cobbler and it was really good. But, it requires milk, and I didn’t have any in the fridge nor was I going to run out and get any (remember…laziness). 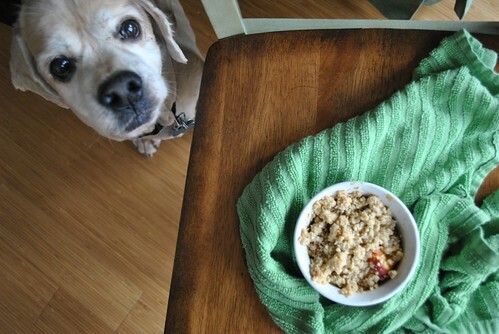 How about Peach crisp then? I did a quick google, and first recipe that popped up used ingredients I had on hand. Done and done. I actually lied. I didn’t really have everything on hand, so the biggest change I made between Anne Burrell’s recipe and mine is subbing in the zest of a whole orange and juice of half an orange for the zest and juice of a lemon. I thought I had a lemon, but I did not. Instead I had an orange that had been sitting in my fridge for a couple of months, but was still miraculously good. I also adjusted some of the sugar since oranges were sweet, unlike lemons. I also used four 7oz ramiekens and one 9″ pie plate instead of the 6 ramekins she uses. 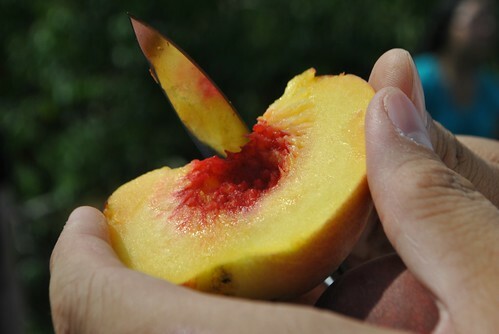 First thing I did was wash, pit and cut up 5 peaches into chunks. They don’t have to be uniform, but should be about 1″ chunks. If you want to scale down the recipe, I found about half a peach fits into one ramekin. 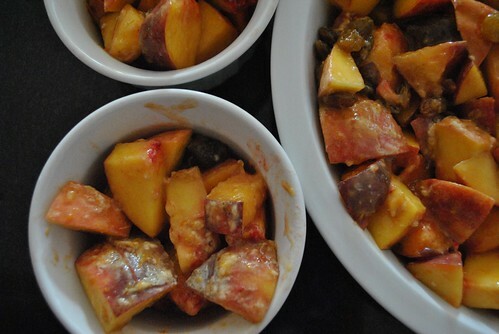 Put all the peach chunks into a mixing bowl and toss with the zest of one smallish orange and juice of half of the orange. Eat the other half of the orange. Then into the bowl, put 3 tablespoons of all purpose flour, 1/4 cup of loosely packed brown sugar, 1 tablespoon sugar, 1/2 teaspoon vanilla extract and a generous 1/2 cup of golden raisins. Toss it all around until nicely combined. 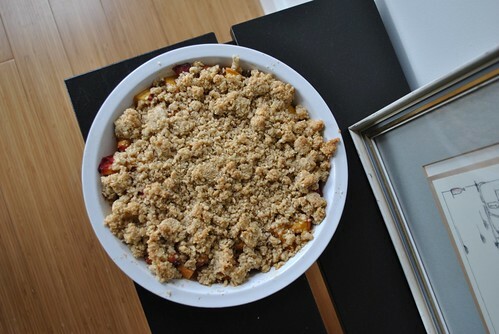 Divide up the peach mix between the vessels and put aside on a baking sheet. Into the bowl of a food processor add: 1 1/4 all purpose flour, 1/2 cup of rolled oats, 1/2 cup loosely packed brown sugar, 1/2 cup sugar, 1 1/4 sticks of unsalted butter, cold and cut into pea-sized pieces, 1/2 cup sliced almonds, and a pinch of kosher salt. Pulse the mix until combined, then add 1 tablespoon cold water and pulse, then add another tablespoon-ish of water and pulse until the mix looks clumpy, but is still crumbly (a full second tablespoon might not be needed, so just start with half and see where the mix is at before adding it all). Sprinkle the mixture over the peaches, but don’t press it in. Put it into the oven until the insides are bubbly and the top is crisp and brown. It should take about 25 minutes. Mine took over 30 for the ramekins and over 35 for the pie plate. Just keep an eye on it after 20 minutes. I let them cool a bit on a wire rack until they were cool enough to handle. Then I dug in! It was quite yummy. The orange was a good substitution. 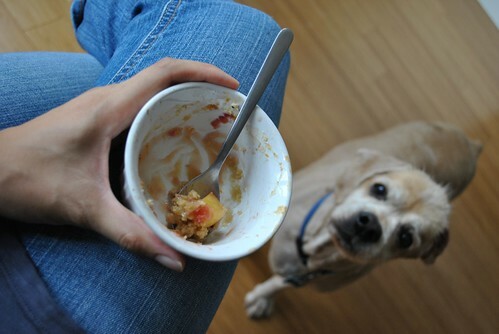 It was orangy, and peachy and the golden raisins gave it a nice extra sweetness to it. The peaches were not super ripe and were still pretty firm, which worked out really well for this crisp. The peach pieces were softened but were still solid enough to not leave a ton of liquid on the bottom or taste mushy overall. 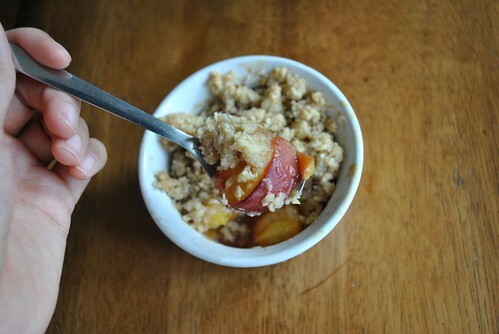 The topping wasn’t super sweet, but offered a nice contrast to the more citrus-y sweetness of the insides. Really best served warm, and good enough to not need ice cream on top! I’m sharing the pie plate one tonight for dinner, but the other three ramekins are mine! For later…. 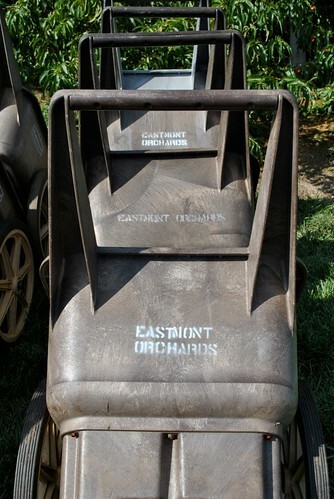 This entry was posted in Dessert, Fruit and tagged crisp, orange, Peach, Peach Crisp. Bookmark the permalink. 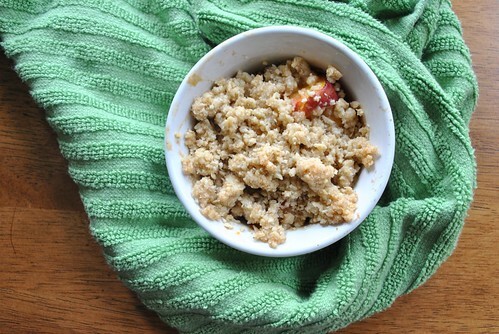 Love peach crisp! 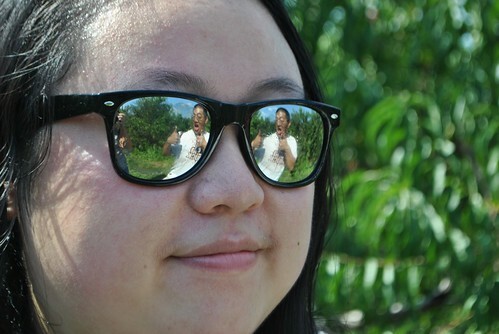 So perfect for summer. Thanks for sharing! I always enjoy your food adventures Sylvia!!! Yummy!!! This sounds killer! 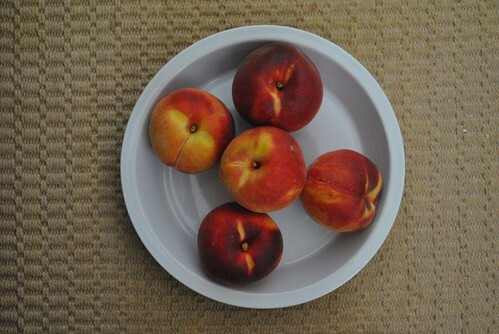 I’ve been buying my share of peaches and nectarines lately too. 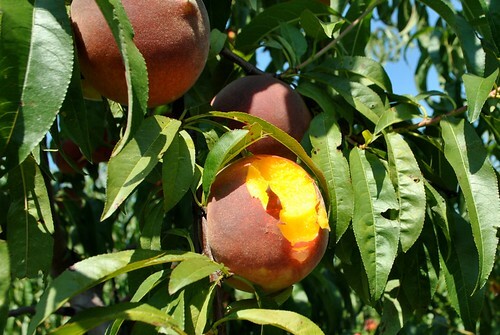 Have never gone peach picking before either. FYI – if you’re making mini pies in the future (with a crust on the bottom) you can always use cupcake tins!